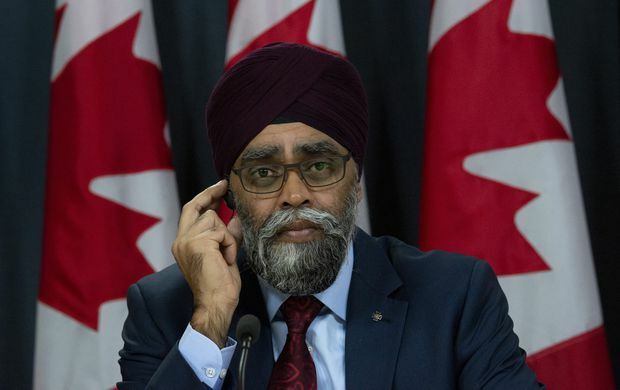 Defence Minister Harjit Sajjan told reporters the government needs to make sure that any changes allow for 'flexibility within our system' so the Forces are protected and can also be effective. A parliamentary committee formed to address national security concerns is calling on the federal government to bring in greater scrutiny to the military’s intelligence-gathering activities. In its first annual report, released Tuesday, the committee outlines a number of national security threats facing the country and questions why the Department of National Defence (DND) and the Canadian Armed Forces have not had to undergo any independent reviews. The report says that the intelligence-gathering functions in the DND and the Forces are largely unknown to Canadians and an external review of their intelligence program has never been conducted. This is despite the fact that it is among the largest programs of the Canadian security and intelligence agencies and is expected to grow. “The committee believes that independent, external review of security and intelligence activities is a foundational part of improving public confidence and trust in the activities of security and intelligence agencies,” the report says. The DND and the Forces, the report says, can carry out intelligence activities similar to the Canadian Security Intelligence Service, the Communications Security Establishment or the RCMP, but those agencies are governed by legislative authority that the military is not subjected to. Defence Minister Harjit Sajjan told reporters the government needs to make sure that any changes allow for “flexibility within our system” so the Forces are protected and can also be effective. National security and defence experts welcomed the report, calling it the first of its kind and agreeing that the DND should be covered by legislative authority. Michel Drapeau, a lawyer and professor who specializes in military law, said the report raises awareness of threats and a “glaring point is lack of accountability” over the DND’s intelligence. Mr. Drapeau said he believes the DND needs to operate within a legislative framework. He also said that just because MPs are now suggesting the idea of legal authority to govern the intelligence-gathering activities of the DND and the Forces, does not mean the military is acting outside the law. Stephanie Carvin, an associate professor at Carleton University and former national security analyst, said the committee is really questioning when the DND is allowed to engage in defence and intelligence activities and what actually permits it. Ms. Carvin also said that the report is a step in the right direction because Canada was one of the few Western countries not to have any legislative review of its intelligence apparatus. The report also named Russia and China as “among a handful of states” that conduct espionage and exert influence in Canada.